When I recently wrote about Harry Partch, I made no mention Danlee Mitchell's Harry Partch Foundation in San Diego, which had custody of the Partch instruments from 1972 to 1989. For this omission I apologize. 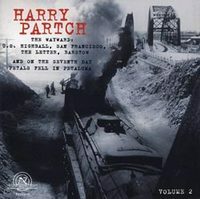 Incidentally, four important recordings of Partch's music, originally put out by the late lamented CRI label, have now been reissued by New World Records. Also, Innova, the label of the American Composers Forum, has a series of archival Partch issues, including a recording of the 1952 premiere performances of Oedipus, at Mills College, Oakland. Actually entitled King Oedipus, this original version of the opera uses W. B. Yeats' free translation of Sophocles; Partch later had to substitute a new libretto when the Yeats estate refused to cooperate. It's thrilling to have Yeats' text woven together with Partch's music. Of all composers, though, he is the one you have to hear live: most of his effects of resonance are lost in translation.